At Hootsuite, we’ve published hundreds of blog posts and crafted thousands of social posts. Some work wonderfully. Others fail miserably. 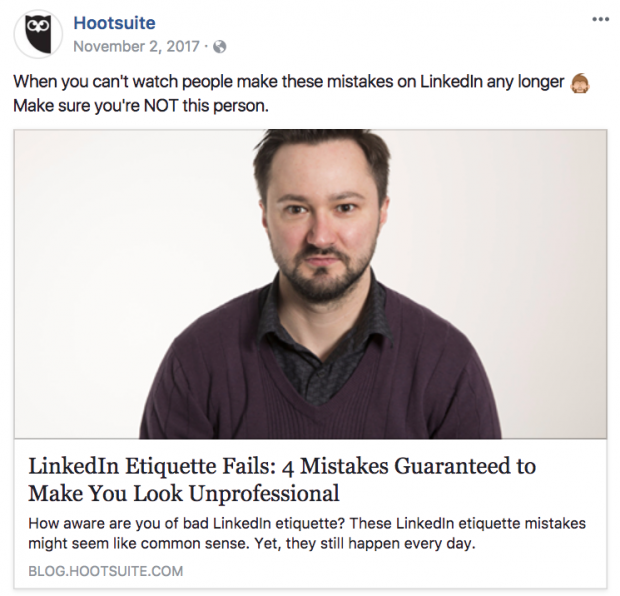 Today, I’d like to skip over the mountains of mistakes we’ve made in the past and focus on Hootsuite’s most successful social posts of 2017. Let’s jump into what worked in 2017. Our top-performing social video of 2017 was a listicle of TED Talks for social marketers. This video was based on a successful blog post (written by Hootsuite’s Dara Fontein). If you look at the copy in the social post, you’ll notice a very clear promise to the reader: we did work so you don’t have to. 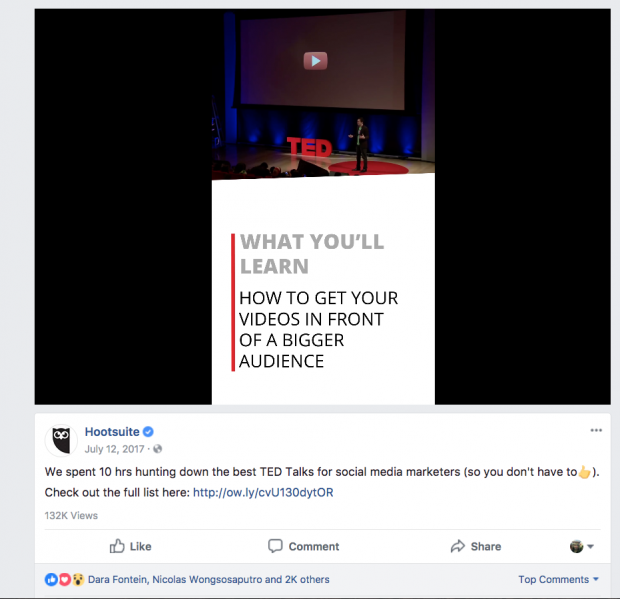 This value proposition—“we spent 10 hrs hunting down the best TED Talks for social media marketers (so you don’t have to)”—came from Dara’s original blog post. It’s a good reminder that the content format doesn’t really matter. It’s more important to have a compelling concept and simple story that can be told across multiple platforms—whether text or video. As we saw success with the TED angle, we created a similar social video called “3 TED Talks to Boost Your Creativity.” It wasn’t as successful. Guess you can’t win them all. We also use Hootsuite’s social video integrations—including Facebook, YouTube, Twitter, and Instagram—to schedule successful video content again and again. This feature is included in all our plans including for free users. 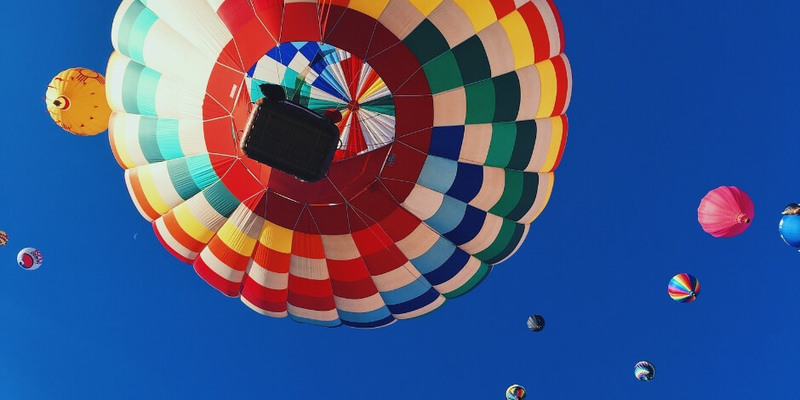 Instagram is a fast-evolving network with an endless amount of new features. And we know that our audience of social media professionals need to keep up with these changes. 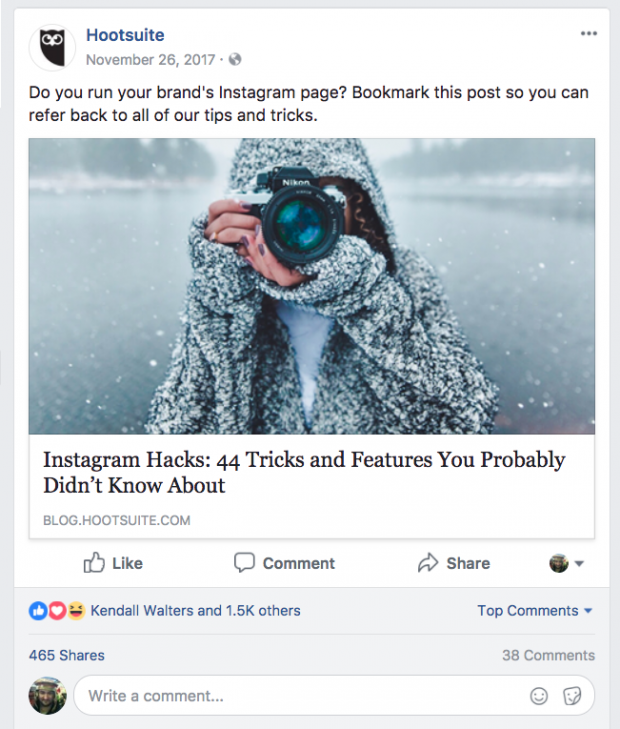 In this Facebook post, our goal was to use curiosity to attract readers to our blog post, enticing the reader to make sure they know all of these helpful tricks. If you look closely at the metrics above, you’ll notice that this copy was incredibly successful at driving one particular metric: link clicks. This is the holy grail for promoting blog post content on Facebook as you obviously want people to click through to the post, not just comment or share. As a side note, if you’re wondering how we gather data about our social media performance, we use our own solution Hootsuite Impact. With Hootsuite Impact, it’s pretty easy to gather data on different content formats (like video or paid posts), quickly create reports, and simplify UTM tracking. Love them or hate them, the concept of “hacks” work. We’ve used the “hacks” format for other social networks with similar results. It’s easy to hate on these types of posts—but the reality is that our minds enjoy the pull of curiosity. Our top-performing Instagram post of the year included—as you’ve likely guessed—a dog. Hootsuite, of course, is a dog-friendly workplace. Posts like these are part of our Instagram strategy—sharing customer stories and glimpses of our workplace culture. Though, we didn’t expect a simple photo of a dog to do so well. I think we’ve covered this. When Instagram content performs well, we reschedule it. By the way, you can now schedule Instagram posts directly from Hootsuite. No workarounds. Just click and schedule from your dashboard. This feature is included in all plans including our free plan. 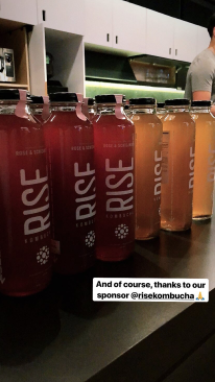 As I mentioned, we use Instagram to share customer stories, build our employer brand, and share education with customers. Our top Instagram Story for the year was pretty simple: a behind-the-scenes look at one of our customer and industry events held by our advocacy team. Instagram and live events are a powerful combination. 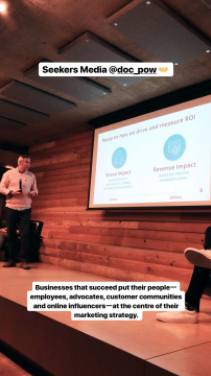 This Instagram Story was widely viewed by attendees looking for a few tips about measurement and ROI strategies. In our final post—a successful blog article about LinkedIn etiquette tips—I am faced with the rather odd professional job of explaining why the internet loves to laugh at my face. As you can see above (or from the comments on the post), it is the photograph that helped to make this one of our most successful LinkedIn posts of the year. The good news is that this photograph worked, bringing lots of engagement every time we share this post. Apart from me nailing the look of a workplace weirdo, the copy also uses a sense of urgency to make sure you’re not making one of these mistakes. As I covered in our Social Trends 2018 webinar, we’ve seen LinkedIn evolve their social features. This means that LinkedIn offers a bigger platform of content beyond white papers or your standard career advice posts. We’re looking for more ways to balance this humor and emotional-style content on LinkedIn, while also making sure we’re delivering practical things that help people do their job better. If you’re interested, here are a few tools that Hootsuite’s social team uses to manage our campaigns and report on ROI. 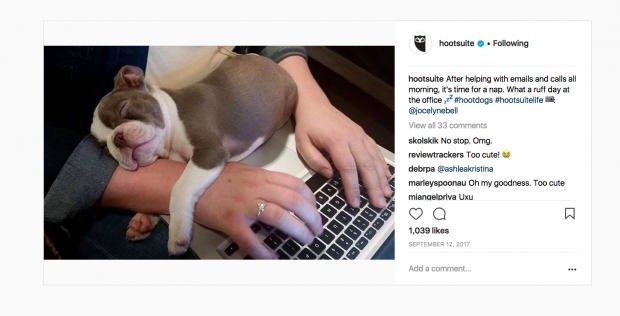 Scheduling Instagram content: As mentioned, we use Hootsuite to schedule Instagram content. It’s a feature of all of our plans, including free. Schedule your first Instagram post here. Hootsuite Impact: we use this solution to track UTMs, gather data about content performance, and measure the revenue impact of our content. As you can see below, it’s easy to analyze different content formats including video, text, photos, and paid social. Learn more about Hootsuite Impact here. AdEspresso by Hootsuite: this tool helps us easily optimize and test different Facebook ad formats. It’s an amazing product—and now, the AdEspresso team works at Hootsuite, so we’ve been able to learn a ton about paid social from them. Learn more about our tool (and download some helpful paid social resources) here. Social video integrations: we schedule and manage our Instagram, YouTube, Facebook, and Twitter videos using our native video tools. This feature is also included in all of our plans, including free. Use our video tools here.